A teenage girl who stabbed a school support worker in a "ferocious" attack has been sentenced to seven years in custody. 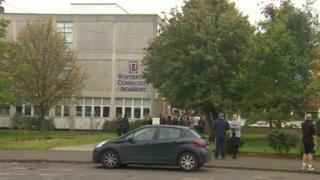 Elisha Burkill, 16, knifed Joy Simon, 61, in the face and chest at Winterton Community Academy, Scunthorpe. Mrs Simon was "thrown about" by the force of the attack, Hull Crown Court heard, which had to be stopped by a teacher and dinner lady. Burkill admitted wounding with intent and possessing a bladed article. She was initially charged with attempted murder after the attack in September but admitted the lesser charge in December. The court heard that Mrs Simon had worked at the school for 24 years and was an Inclusion Support Officer, looking after the welfare of students. Prosecutor Richard Wright QC said Mrs Simon was in her office when she was stabbed with a three inch knife on the morning of 24 September, suffering wounds to her chest, arm and face. Mr Wright said she was "thrown about by the force and ferocity of the attack upon her" which was only stopped when a dinner lady and a teacher intervened and restrained Burkill. In a victim impact statement read to the court, Mrs Simon, whose husband died three years ago, said the "trauma and shock" of what happened to her has changed her life "forever". The prosecution said that during an interview with a psychiatrist Burkill had said she wanted to hurt Mrs Simon because "she had done nothing" to help her with her problems. The court was told Burkill had no contact with mental health services but had a long history of a depressive illness. Sentencing Burkhill, Judge Jeremy Richardson QC told her: "You have a chameleon-like temperament which can fill with fury and anger on occasions. "That is self-evidence from your vicious, brutal and determined conduct with a knife towards Mrs Simon." He added: "I harbour real and present fears that you pose a significant risk to other people of inflicting serious violence upon them if you saw the need." Burkill, who can be named after Mr Richardson lifted an anonymity order, will spend five years on licence following her release.